A city that is building a rapid transit network piecemeal has to decide on priorities. There are tools for deciding where to build the first line, such as looking at the surface transit network and seeing what the busiest corridor is. These are relatively well-understood. In this post I’d like to focus on where to build the second line, because that question depends not only on the usual factors for where to build transit, but also on how the first line is expected to change the network. This is relevant not only to cities that are building a new rapid transit system, but also to cities that have such a network and are adding new lines one at a time: the usual tools can straightforwardly suggest where to build one line, but figuring out where to build a second line requires some additional work. Let’s stipulate that there’s a wealth of arterial roads radiating in the right directions, and no motorways entering city center, so the exceptions to the rule that trains should go where the busiest buses are don’t apply. Let’s also stipulate that the other buses in the city don’t affect the internal ranking of the first five much – so if there are a bunch of north-south buses close to route C not depicted on the map, they’re not busy enough to make it busier than route A. Clearly, based on the A > B > C > D > E ranking, the top priority for a first rapid transit line is A. Not only is it the busiest bus but also it is parallel to the second busiest. But the second priority is not B, but C. The reason is that a rapid transit line on A captures east-west traffic, and then from the eastern and western neighborhoods people on route B are likely to walk south or ride a circumferential bus to get to the train. In the presence of a subway underneath the arterial carrying route A, the strongest bus corridor will almost certainly become C, and thus planners should aim to build a subway there as their second line, and begin design even before the first subway opens. Vancouver already has a rapid transit system, with three SkyTrain lines. However, the issue of the second line crops up when looking at remaining bus corridors and future subway plans. The strongest bus route is by far Broadway, which had higher ridership than the buses that became the Millennium and Canada Lines even when those lines were planned. The Millennium Line was only built first because it was easier, as it is elevated through the suburbs, and the Canada Line because Richmond demanded a SkyTrain connection. Fortunately, Broadway is finally getting a subway, running from the Millennium Line’s current terminus at VCC-Clark to Arbutus, halfway toward the corridor’s natural end at UBC. The question is, what next? The second busiest bus corridor in Vancouver is Fourth Avenue, where the combined ridership of the 4, 44, and 84 buses and the part of the 7 that is on Fourth exceeds that of any corridor except Broadway; only Hastings, hosting the 95 and 160, comes close. And yet, it is obviously wrong to plan any subway on Fourth Avenue. Fourth is half a kilometer away from Broadway; the 44 and 84 are relief for the 99 on Broadway. TransLink understands it and therefore there are no plans to do anything on Fourth – the next priority is extending the Expo Line farther out into Surrey or Langley, with the exact route to be determined based on political considerations. In New York, two commonly-proposed subway extensions, down Nostrand and Utica, are closely parallel. The fact that they are so close to each other means that if one is built, the case for the other weakens. But these two corridors are so strong it is likely that if one is built, the second remains a very high priority. The only subway priority that is plausibly lower than the first of the two and higher than the second, regardless of which of Utica and Nostrand is built first, is a 125th Street crosstown extension of Second Avenue Subway. In addition to four-tracking the North River Tunnels under the aegis of the Gateway project, the RPA calls for two additional two-track tunnels under the Hudson, in phases 2 and 3 of its proposal. Both are to feed Midtown: the phase 2 tunnel is to connect regional rail lines to be reactivated with Columbus Circle, Grand Central, and other destinations in the city, and the phase 3 tunnel is to then carry the same line out of the city and back into New Jersey via Hoboken and the existing commuter lines serving southern and southwestern suburbs. The logic, as I understand it, is that Midtown is the core of the New York region, and so it is the most important to connect there. I don’t know if this is what the RPA was thinking, but I asked at an IRUM meeting in 2010 why all plans involve connections to Midtown rather than Lower Manhattan and was told Lower Manhattan was not as important a business district. The toy model has one fixed city center and varying outlying areas, the opposite of the situation here. Here, my criticism is of plans that serve the dominant city center while ignoring the second most important center. The total number of jobs in Midtown is 800,000 whereas Lower Manhattan has 250,000 – but Lower Manhattan is more compact, so a single station at Fulton with several exits can plausibly serve the entire area, whereas Midtown has areas that are too far from both Penn Station and Grand Central. 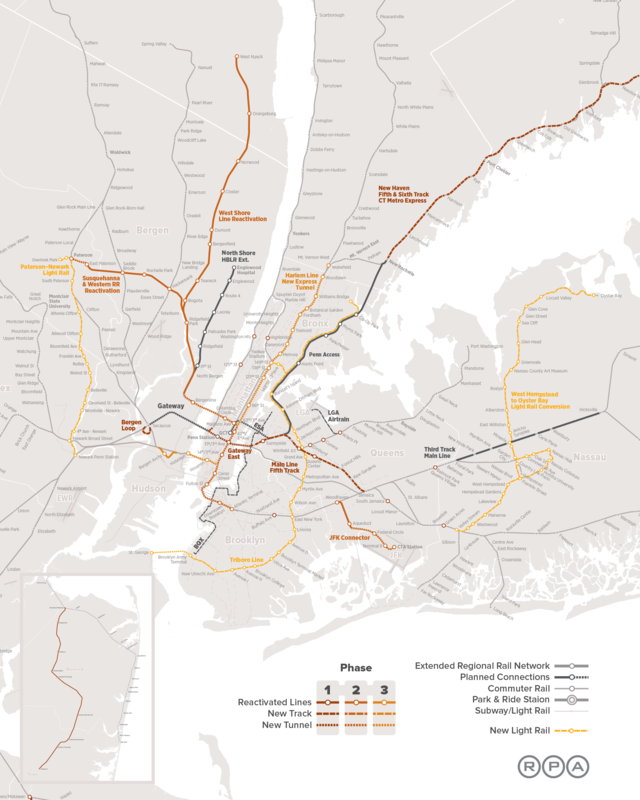 The next pair of tracks should serve Midtown, but the pair after them should serve Lower Manhattan, to ensure good coverage to both business districts. Given that most of the buses running over 4th Ave have long tails elsewhere I can see why such a method would make it look more important than it is. Overall, 4th is nearly as busy per stop as Hastings, Hastings has just a greater length of built up areas around it. I think in most cases the second line well tend towards costing the first at a right angle near downtown. Once two such lines exist the interesting question becomes: where do we put the third line? By now it had become clear that a third line would strain the financial abilities and a fourth was out of the question for the time being. It was also decided not to shut down the tram network as originally planned. So what did Nuremberg do? They tagged on branches to U2 creating a northwest center southwest U-shaped line and called it U3. To do so, they had to increase capacity on the shared trunk which they did by automation. Speaking of Broadway, the council just approved the line all the way to UBC. They should have done the whole extension in one go in the first place though. Ooh. Do they know how to fund it? I don’t know about that. It now seems to be stuck in the same position as the Langley SkyTrain at this point. Apparently it needs to pass the regional board too and they intend to vote on that soon. Not too familiar with Vancouver area politics but that’s what I read. This is another good example of why transit design is always a balancing act. It is tempting to apply a simple criteria (e. g. the most popular bus route). While that is a major consideration, there are a lot of caveats, as you mention here. A bus route may be very popular because it is one of the few fast and frequent buses in the system. When the system improves — when other lines are converted to subways — a particular line may be a lot more popular, or it may lose ridership. The nearby improvement may cannibalize the other line. I agree, 4th seems like the type of route in that last category. Just looking at the census data and the network in general, it seems like the next SkyTrain route after Broadway should be Hastings. I would add at least one station to the west of Burrard (the West End seems under-served by SkyTrain). I think the challenge would be where to end it (to the east). I don’t see any great anchor (there is more of a general fading away of density as you move out). 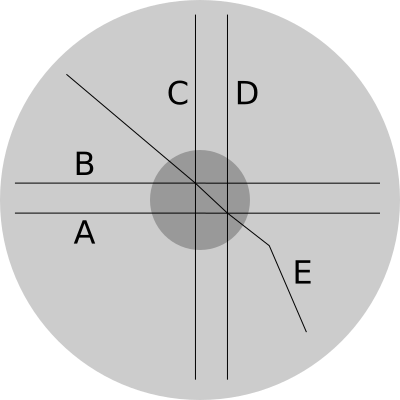 You could curve and connect to the Millennium Line, which would improve connectivity, but then you lose some coverage. Of course a big issue with any plan is cost. That is yet another factor. There are bus lines that perform quite well, but would be really costly to replace with rail. My guess is that a lot of suburban extensions are done for this (and political) reasons. It isn’t that they carry lots and lots of people, but that they are relatively cheap to build. 1) The end of the Expo line already points in the right direction, and serves downtown stations. I would not dig a new downtown tunnel. 2) The best anchor on the east end is Willingdon. It’s the last bit of reasonable density, and there’s a significant confluence of local Burnaby and North Vancouver bus routes there. The other option would be to go across the Second Narrows. There is a question of stop spacing. There’s no particularly good cut and cover or elevated corridor to use along Hastings. Cut and cover is near impossible west of Main St, at the CN rail crossing, and at the Cassiar valley. Thus, a bored tunnel with wider stop spacing, say `waterfront, main, commercial, Nanaimo, Renfrew, Kootnay, Willington, would seem the way to go. This also maximizes benefit while minimizing run time and rolling stock needs: the only good places for a yard is to build overtop of the rail tracks at Waterfront ($$$), or to dig out small underground yard, possibly at the PNE parking lots. 1) Another great example why cost is such an important factor. The area west of the downtown stations are very high density. The only other places that are even close (and don’t already have subways stations) are along Hastings and the areas that will be covered with a UBC/Broadway line. With all that density (and a connection to the other two lines) ridership per station or ridership per mile is likely to be some of the highest in the system. It makes sense to build a line there with a couple new stations. But only if you can afford it. 2) Yeah, Willingdon makes some sense. It works, but it also doesn’t seem like a great anchor. This is in contrast to the UBC line. Density is higher on other parts of the line, but the university itself is a strong anchor. But as you say, the confluence of bus service and lack of anything better farther away make Willingdon the logical choice and probably the best option. I disagree about the stop spacing though. It doesn’t make sense to me to go through the expense and bother of building a new line and then putting in only a handful of new stops given the relatively low density and low distance to the east. Yes, stations that connect to deep bore tunnels are expensive, but in the central core of the city, they pay off fairly quickly. If you aren’t in the central core, then it probably doesn’t make sense to continue to go deep bore. I could easily see a combination of deep bore and elevated or cut and cover for a Hastings line (similar to the Canada Line). The issues are tricky though (nothing seems obvious with such a line).